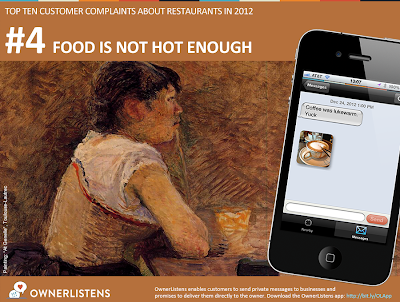 We are moving along in our countdown of the Top 10 Customer Complaints of 2012! To catch up on all the great posts in this countdown thus far, view our previous entries here: #10, #9, #8, #7, #6, and #5! It may be surprising at first that such a specific complaint could land this high in our countdown. However, looking into the feedback in more detail, we have noticed a couple interesting things. First of all, customers can be especially sensitive to the temperature of their ordered items for a variety of reasons. Perhaps it’s cold outside, or perhaps temperature signifies how well something is prepared, or how promptly it is served. Either way, it’s food temperature something that customers pay attention to greatly. Second, more than other types of feedback on our countdown thus far, food temperature issues often seem to be recurring issues that owners struggle to address over time. While owners may apologize and compensate customers for improperly served dishes on a case by case basis, it appears more challenging to address the underlying cause behind food being served cold and correct this issue generally. Interior atmosphere. A consistent interior temperature is something almost every restaurant struggles with. Customers are typically entering and exiting constantly making your interior atmosphere vulnerable to outside conditions. Additionally, kitchen equipment typically generates heat. Beyond this, vents, fans, windows, and density of customers create additional inconsistencies in the atmosphere in your restaurant that can directly impact food temperature. Do some investigating, become familiar with your hot and cold spots of your business, and do what you can to compensate. Perhaps you can turn an A/C vent away from a table top to prevent served plates from being chilled or remind staff to turn a kitchen vent on near the oven to keep nearby tables from getting too hot. Serving dishes. The temperature of your actual dishes can have an immediate affect on the temperature of your dishes. Make sure your dishes aren’t stored in near an A/C vent or in a chilly cabinet to prevent hot dishes from being served on chilly plates. If necessary, consider purchasing plate warmers you can purchase to correct for this. Retaining a couple repeat customer will make up for the cost of this appliance. Expectation. After examining the feedback, we found a number of food temperature complaints that were the result of customers misunderstanding how a particular dish is served. These situations could be simply averted by better describing the dish on the menu or via the server. This certainly doesn’t need to be done with every dish but if you are, for example, serving a room-temperature or cold soup, it’s helpful to note this in the description; by default, consumers expect soup to be warm unless informed otherwise. Be careful with your wording as well; terms such as “spicy” vs “hot” can be misunderstood so make sure you are describing your dishes correctly. Preparation. It’s essential that dishes at your restaurant are consistently prepared well in order to mitigate risk for inadvertently serving dishes cold. Check in with your staff and sample dishes at different dining times to ensure your customers are enjoying your food they way you intended. You may find that during peak hours, there isn’t enough space under the food warmer for all orders or a particular cook is forgetting to place plates on a warmer when ready. Identifying and adjusting for these situations can reduce occurrences of dishes at your restaurant being inadvertently served cold. Service delays. This is a very common struggle for many restaurants. 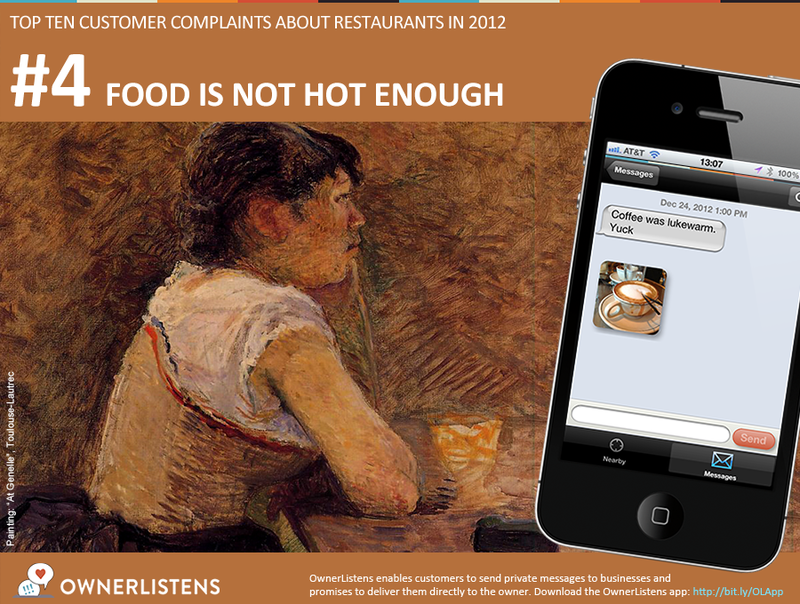 Indeed, delays in service can directly impact the temperature of food served at your restaurant. You may find that during peak hours, overwhelmed servers aren’t able to check on orders in the kitchen as frequently as necessary. Adding an extra shift during peak hours can resolve this. While it may feel difficult to justify paying another server for 2-4 hours of work, remember it could prevent complaints about food not being hot enough and gain you a few return customers! In the end, identification is the first step towards resolution so do what you can to figure out where temperature problem are occurring at your business. Make sure your customers know to send you feedback with OwnerListens so you can determine if your strategies are working and address any complaints in real-time. If you haven’t done so already, sign up for OwnerListens now. Owners – Have specific tips for how to address food not being hot enough at your business? Share them here! Consumers – Have you experienced food being too cold at local businesses near you? Let the owner help before you yelp by using the OwnerListens app!